Preheat the oven to 375 degrees F. Line a 14-inch, light colored, round pizza pan with parchment paper and grease the parchment paper. In a bowl, combine the flour, baking soda, and salt and mix with a whisk. Add to the butter mixture, mixing to incorporate, and add the vanilla extract. Fold in the chips and the nuts. 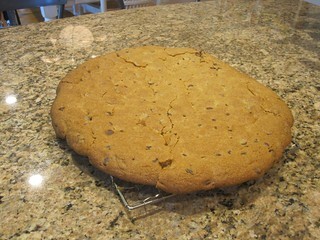 Spread across the bottom of the prepared pan and bake until the edges are golden and the cookie is set but the center is still slightly soft, 20 to 25 minutes. Cool in the pan for 10 minutes, then transfer to a wire rack to cool completely. To serve, sift confectioners’ sugar and sweetened cocoa over the top, and cut into wedges. Serve sweetened whipped cream on the side.